Why is there a 2nd Amendment debate? … which means We The People can decide what the capitalized term “Arms” mean. For example, I The Person does not want the definition of “Arms” to include pressure cooker bombs or suitcase nukes or anything that can take out an entire movie theater or a 1st grade classroom. The brilliance of the way the 2nd Amendment is written is it not only allows but requires We The People to define “Arms”… and regulate accordingly. And, we get to do that without changing a single word to the actual amendment. Why do some folks believe that is not the case when it’s written so plainly? It is absolutely tragic what happened in Boston. Yet, I haven’t been able to bring myself to engage in the popular discussion. In fact I have, for some unknown reason, actively not watching things on the news about it. Until now. Because I figured out why. Tragically the publicizing of these kinds of events is used more for military fund raising than anything else. The more outrage and hysteria there is, the greater military budgets will swell. It’s an awful, awful way to think… but this is what happens. I’m not saying we should bury our heads in the sand… nor am I saying that we aren’t living in a progressively more dangerous world. What I am saying is that whatever we’ve been doing isn’t working. We live in a world of guns and explosives. We helped create and actively protect this world. Yet, when people use guns and explosives inappropriately, we’re always so shocked and stunned. Ugh. Prepare to have your shoes x-rayed this summer at your local 4th of July parade. More freedoms being suppressed under the banner of protecting freedom. I guess one never really knows where to start with something like this. Maybe I’ll start with this service. My mom loved people… but hated funerals… so I know she’s very appreciative and thankful to all of you that were brave enough to come today. On behalf of my entire family, thank you. … really, the importance of being part of a larger community… and the idea that there was something greater than oneself. She taught us that… my mom. My mom taught us almost all of the really hard but so important lessons in life. …to go DO something… to MAKE a difference… and whether it’s big or small… that it A-L-L counts. She taught us that not only in words… but by her actions, too. Those of you who really know my mom know when she set her mind to something… whether this was something SHE was going to accomplish — or whether it was something YOU were going to accomplish… you had no choice, it was going to get done. … it was going to happen because my mom said it was going to happen. As if this wasn’t big enough in my life, my Uncle Nicky recently wrote a lovely tribute to my mom that put this in an entirely new, entirely BIGGER perspective for me. …but not for my mom… she was determined to have a better life… and ended up leading the way for her ENTIRE FAMILY to come to California where there were dreams and opportunity. … but it’s quite another to affect the lives of your ENTIRE family when you have no experience, no resources, no support… and you’re just a kid. …and if you knew one thing about my mom, you knew YOUR life was going to be better simply because you knew my mom. … even though she was a Californian through and through… fashionable… well traveled… well read… probably the most tanned Irish woman on the planet… she never lost her good ‘ole fashioned New Orleans southern charm… a DISARMING charm, the best kind… she could make anyone — even complete strangers — feel welcome and special. It was magic. She was magic with animals, too. Animals LOVED my mom. My favorite way to describe my mom is as the female Dr. Doolittle. … and along the way had countless other loving pets… including a white mouse named Penelope that we snuck on board a plane one summer on our way to Hawaii, a turtle named fluffy, a gold fish named Pearl, a thoroughbred horse name Gebaru, an adopted skunk, families of raccoons, and so many cats we’ve lost count. Her most beloved pets, however, were her two massive Irish Wolfhounds, who individually each outweighed my mom… and collective pretty much outweighed all us kids in the house. Decades later, you still couldn’t tell a pup story without it bring a tear to my mom’s eye… she was just the kindest and best animal person that I’ve ever known. My mom had a special gift for throwing parties. Could she ever! She was a sight to behold… bright pink cocktail dress… perfectly styled hair… like she walked right out of the pages of a fashion magazine. That was another lesson she taught us… doing the RIGHT thing can also mean doing the BEST thing. You know, some of the lessons my mom taught us weren’t so easy…. she had a special gift for putting people in their place, too, when the situation called for it. I wanted to have a party in 6th grade and I created a special list of just the “cool” people to invite. I’m almost 54 years old and I think that is still probably the single most important lesson I’ve learned in life. E-v-e-r-y-o-n-e counts. I learned that from my mom. * Thank you for volunteering so freely of your time with so many charities… Deaf and Hard of Hearing Kids… public television… All Souls Parrish… we kids were really proud of the good work that you did. The last decade or so has certainly been volatile in Silicon Valley. But I was so lucky in that I’m one of the only people I know that — when the going got really tough — I could actually go home… to South City… to Palm Avenue… to my childhood bedroom… to actually get tucked into bed by my mom. When you go to sleep tonight… when you close your eyes… I think that’s something my mom would like to say to each and every one of you, too. She loved everyone so. We love you, too, mom. My mom passed away. I am very sad. South San Francisco, California: Tamara Anne Brown was born on February 16, 1935 and passed quietly on March 18, 2013. 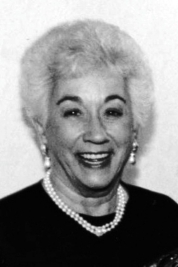 Born in Chicago and raised in New Orleans, Tamara moved to San Francisco in the 1950’s, married, and had four children. Tamara was very active in the community, being a member of the Auxiliary to the Deaf, Deaf and Hard of Hearing Children, the League of Women Voters, and the Woman’s Club of San Francisco. She was also very active in local charities, raising funds for KQED and All Souls Church, where she often ran the parish annual fashion show. She placed a strong emphasis on education and achievement, with all of her children attending college, including one atPepperdine and two at Stanford University. Tamara had a mischievous sense of humor, dressing up as The Tooth Fairy one Halloween and passing out tooth brushes to surprised trick-or-treaters. Tamara loved people, parties, and a good adventure. She was fluent in Greek and spent most of her life traveling the world, often spending entire summers with her family in Greece, Ireland, Hawaii, and other exotic and distant locales. A voracious speed reader, Tamara would emerge from the local library with a grocery bag full of books, only to return the following week for more. Her love of animals knew no bounds, counting a bottle pig, two massive Irish Wolfhounds, and an adopted skunk among her many pets. She spent the later 40 years of her life with her beloved second husband Richard A. Brown, a retired military officer. Tamara and Richard continued to travel the world, meeting new friends all along the way. Tamara’s gift was people, making even strangers feel welcome and special. Professionally she alternated time between market research and travel consulting and excelled at both. Tamara was enthusiastically active for decades in the local Beta Sigma Phi Sorority and, along with Richard, socially as part of the Francis Drake Masonic Lodge 376. Tamara is survived by her husband Richard, her children Nickoletta, Royal, Lisa, Stephanie, Michael, Philip, and Theresa, son-in-law David and daughter-in-law Laurie, grandchildren Jason, Joshua, Katherine, and Elle, her brother Nicky and sister-in-law Irmgard and their children Alexander and Valerie, her little white terrier Dakota, and, at 78, many close friends and cherished friendships spanning a full and rich lifetime. Her eldest child Anastasia (Doodie), taken by diabetes at an early age, remained in her heart until her last breath. Services will be held at All Souls Church in South San Francisco on Tuesday, April 2nd at 12:00pm. Because of Tamara’s great love for animals, donations can be sent to the local SPCA in lieu of flowers.